Season with salt and pepper and spread into one layer on a parchment or foil lined baking sheet. Cook for about 35-40 minutes, or until tender. Let cool slightly. Discard the thyme. Meanwhile, in a small baking dish, drizzle the fennel wedges and carrots with the remaining 1 tablespoon of olive oil and season with salt and pepper. Bake for about 15-20 minutes, or until tender and lightly browned. (I put the fennel and carrots into the oven while the beets were baking). In a small bowl, add the juice the juice of an orange and whisk in the vinegar. While the vegetables are still warm, add the citrus and vinegar mixture and toss well. Season with salt and pepper. If you think it needs a bit more brightness, add another splash of vinegar or squeeze more orange juice on top, and toss again. Serve warm or at room temperature. This can be made ahead, but you may want to store the beets separately from the fennel and the carrots, as the beet juice will stain everything pink - though it IS very pretty that way. Taking it to the next level. Because of this household’s love of the beet, I made a LOT of this salad for just two people. The first night, we ate it as is, and loved it. The second night, I mixed things up a bit by adding toasted hazelnuts, fried capers, and goat cheese crumbles. Just delicious! And I even have some left for lunch. I swear, my insides must be stained beet-red by now. Cutting Corners. Since you all seemed to appreciate my shortcuts in the last post, I will suggest them any time I can in the future. I certainly use them all the time! If I were craving this salad, but was short on time, I would definitely buy those pre-cooked beets that have been popping up in the produce aisle recently. The brand I have been buying is called “Love Beets”. They seem to be lightly pickled, perfectly tangy and sweet. 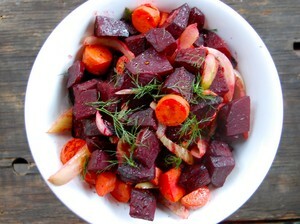 I would roast the fennel and carrots the same way for about 15-20 minutes, cut up the prepared beets, add a squeeze of orange, and enjoy the heck out of them. I’m not sure canned beets would be a great solution, because they can be a little soft and cloyingly sweet at times, but these freshly prepared beets are a wonderful solution.